As you might have guessed by now, there are two main methods used by turntables to spin the platter. Turntables themselves can then be categorised according to which of these methods they use – belt drive turntables and direct drive turntables. Belt Drive Or Direct Drive? Belt drive turntables turn the platter via a belt (a rubber band) which transfers energy from the motor to the plate. However, a lot of power is lost in the transfer here, and accuracy suffers as well. The pitch settings you have chosen might not sustain throughout the track, causing a catastrophic loss of temp sync, and making beat matching extremely difficult. Belt drive decks also suffer from low torque, making them unresponsive and inappropriate for scratching, and they also tend to have an extremely slow start-up lag. It is worth pointing out, however, that belt drive decks are not completely useless, and for a beginner they may represent the best value solution for starting up. Although belt drives tend to be cheaper than direct drive, the cheapest direct drive decks also suffer from the problems mentioned above – and some of the more expensive belt drives can outperform some direct drive decks. So it’s not quite black and white, but if you can afford to splash out on a decent direct drive unit then I wholly recommend that you do so. If you decide to take your career seriously, then this decision will pay you back handsomely in the long run. The responsiveness of a good deck will make your learning process easier, enable you to do things that a lesser piece of hardware won’t, and it will save you from having to upgrade after a relatively short period when you realise that your gear just doesn’t have the necessary power under the hood. If you’re happy to just get a basic set of decks to test whether you’re cut out to be a DJ at all, then belt drive will do fine. If you’re just going to be crossfading from one track to the next, then belt drive will probably do fine. But if you want to be the best DJ you can possibly be, you don’t want to be hindered by inferior gear – get a direct drive. Just so that you know (as if you hadn’t figured it out already), in direct drive turntables the motor spins the platter directly – no rubber bands in sight. This increases the accuracy of the power transfer to the platter, and therefore to the record – meaning that the tempo should stay exactly the way you set it, you won’t be getting unwanted pitch variations and your four-to-the-floor beat should be coming in rock solid. 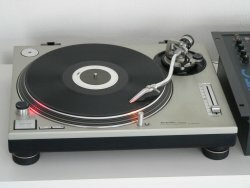 There are a lot of companies making turntables out there; some of them are suitable for Djing and others just aren’t. Consumer models are probably going to be belt drives and won’t have the necessary power or control to do anything more than play track A followed by track B. But just because a company is trying to sell a deck as a DJ deck doesn’t mean that it’s good enough for the job. For example, the Gemini XL-100 is touted as a DJ deck, but it really doesn’t cut the mustard when it comes to getting down to serious mixing magic. However, this doesn’t mean that the Geminis are to be avoided – the Gemini XL-100 is an ‘entry level’ belt drive model, but the direct drive XL-600 is an excellent turntable and a very good starting point for any aspiring DJ. Technics are of course legendary in the world of turntables, with many years of experience in the art of creating a balanced and reliable record-playing mechanism, and they still make some excellent decks. 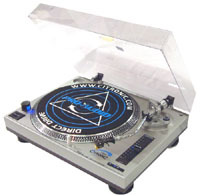 Other well-known manufacturers of quality turntables include Numark, Citronic, Sherwood, Limit, American DJ, Soundlab and Kam. These models will do a decent job on basic beat matching and mixing tasks for relatively simple rhythmic structures such as those found in much house or trance music; however, they will not really be up to the demands of complex scratching when you need to push the boundaries of the music that bit more. Vinyl is by far the oldest personal audio reproduction medium in common use today, and is actually a very simple (yet ingenious) mechanical technology. Although most commonly referred to as ‘needles’ nowadays, the original term for this was the ‘stylus’. The cartridge is the (probably plastic) container that holds the stylus. The most common type of cartridge is the Stanton 500AL, but there are many more – and you must have a cartridge and needle that is compatible with your deck, or you won’t be able to play anything. Make sure you know the type of cartridge your deck uses before you go out to buy some spares. If you don’t know what your cartridge is called, just bring it with you to your local record shop and they’ll be able to provide you with some new ones. So where does it all go? Well, the needle (stylus) fits into the cartridge, which is slotted or screwed into the headshell. The headshell is at the end of the tonearm, which is the long shaft that extends out above the surface of the record itself. When you place the needle into the groove at the start of the record, the rotation of the disc causes the grooves in the vinyl to move past and collide with the needle, creating vibrations. These vibrations are a physical reproduction of the sound that was used to originally fabricate the disc, and are converted into electrical impulses by the turntable. These impulses are fed through the mixer, into the amplifier and then through the speakers to the dancefloor, where everyone can hear them as music.